I started with Morgans in 1974, with a 17-year-old mare named Golden Deb (Keystone x Lady Margaret). 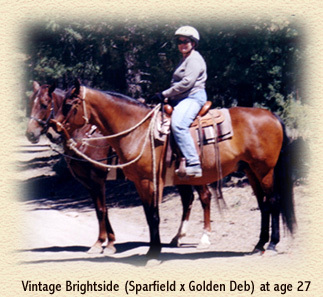 Deb had been used extensively as a Forest Service mount and pack horse, and when bred to the champion cutting horse, Sparfield (Lee Spar x Kitty Spar Field), she produced three outstanding colts that sold me forever on the Morgan breed. The terms “Western Working Family” and “Sport Morgan” weren’t in use then; these were just good Morgans and outstanding riding horses. Golden Deb’s first Sparfield foal, Vintage Brightside was born in 1976 and was shown successfully in western pleasure, hunter pleasure and dressage at both Morgan and open shows. A perfect example of Morgan versatility, “Drummer” has also been used for calf and steer roping and continues to be an excellent trail horse. He is very generous in granting the rider access to his incredible power and strength. As is typical of these hardy Western lines, he remains sound and useful today after three decades as my equine partner. Vintage Midnight Son was Deb’s next foal (1977) from Sparfield. Sold as a weanling, he was used as a sire for several years. 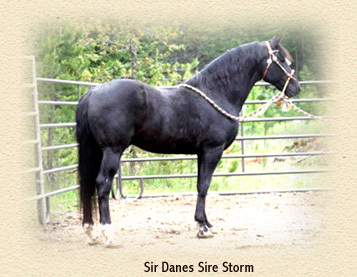 His son, Sir Danes Sire Storm (Vintage Midnight Son x Sparfield Trixianne), is currently being used in my breeding program. Stormy is a double Sparfield grandson and is passing on the traits for strength and athletic ability that are so characteristic of these lines. 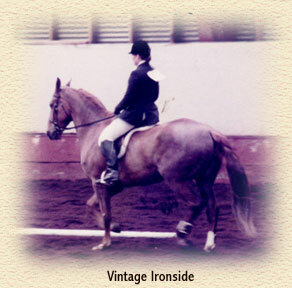 The last of the brothers, Vintage Ironside, was also a versatile athlete, successfully competing in dressage as well as being an excellent trail horse. He was easy to train with a very willing attitude. The photo at the right shows a half halt during his first dressage test. My continuing goal is to breed Morgans with substance and stamina that are athletic and easy to train. I expect these horses to excel in any sport discipline, whether dressage, carriage driving, eventing or cutting. They are also some of the best ranch and trail horses you can find. Because of my personal success with Sparfield descendants, I have incorporated his blood throughout my program.